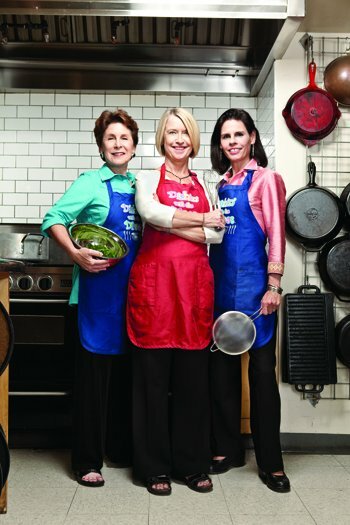 Too many cooks in the kitchen doesn’t seem to bother Mady Kaye, Beth Ullman and Dianne Donovan, aka The Beat Divas. In fact, the trio, who for years performed together as a jazz ensemble, loves engaging with the audience attending their culinary classes at Central Market Cooking School. Between recipe demonstrations, the divas sing original tunes like “Little Bit of Chocolate” and “Sweet Potato Jive.” For those who can’t attend a lesson, their wit and harmonies are showcased on a new CD, Dishin’ with the Divas. How did you come up with the idea for The Beat Divas? Kaye: At rehearsals, all we did was talk about food—where we’ve eaten, where we’re going to eat, what we’ve cooked. We decided to put our love of music and food into one package. Do your audiences have any favorite songs? Ullman: And “Blame it on the Devil,” which is a song about a grandmother who poisons her granddaughter’s boyfriend for jilting her, with her devil’s food cake. How have your families influenced your cooking? Ullman: My grandparents were gourmet cooks, and my grandfather was a big bourbon drinker, so everything had booze in it. Now I don’t like to eat dinner without a glass of wine. Donovan: You don’t like to cook dinner without a glass of wine. Are there any foods that lend themselves to song? Ullman: I don’t know about liver. Kaye: We need to write about chicken-fried steak. Ullman: We don’t sit around and talk about the macrobiotic diet. Donovan: But I can imagine doing a song about quinoa.